Guess what day it is? Anybody? It's Mask Monday! Woop Woop!! Mask Monday is the day where I share my thoughts and reviews on masks that I have tested and tried. They could be the good, the bad, or just plain ugly. I'll share with you guys all the deets on these masks and whether it worked for me or not. As a mask addict lover, I love to try out new masks and discover interesting and unique masks that could also be amazing for the skin. It's a wonderful and fascinating journey and I hope you will join me every Monday to see what mask(s) I've tried and my review on it. Today I am going to be sharing not one but two sheet mask reviews. 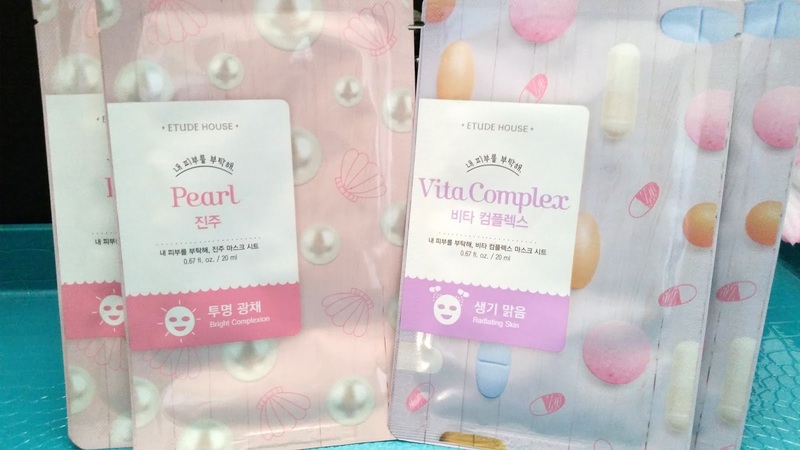 These sheets masks are from the Etude House I Need You line and they are the Pearl and Vita Complex masks. 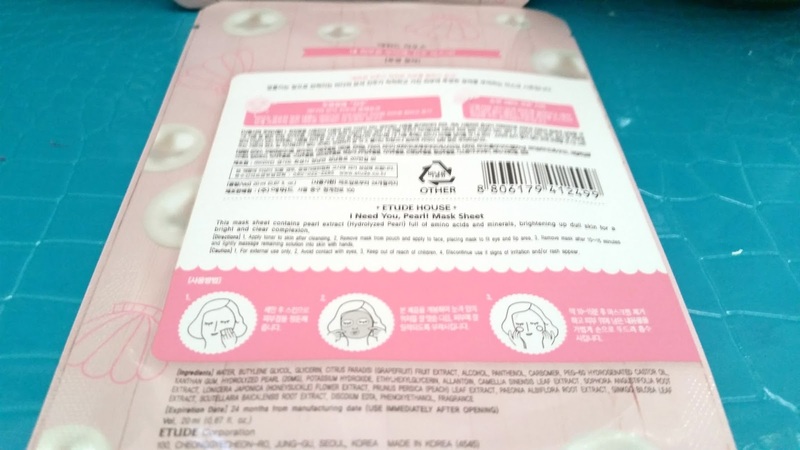 Etude House is known for their cute packaging products. Which explains why the sheet mask packaging is so cute as well. Both the Pearl mask and the Vita Complex mask works to brighten the skin, read on to see which mask works better at delivering a brightened complexion. Product Description: Formulated with various vitamins, this mask works to purify and brighten up dull skin for a healthy and natural glow. It contains grapefruit extract, ginko extract, honeysuckle flower extract and more to help brighten up skin complexion. To Use: Cleanse and tone the face first. Remove the mask from the pouch and apply it to the face. Place the mask to fit the eyes and lips area. After 10 to 15 minutes, remove the mask and massage in the remaining essence. Continue with the rest of the night time skin care routine. Scent: The Vita Complex mask has a perfumed scent and it smells fruity to me. 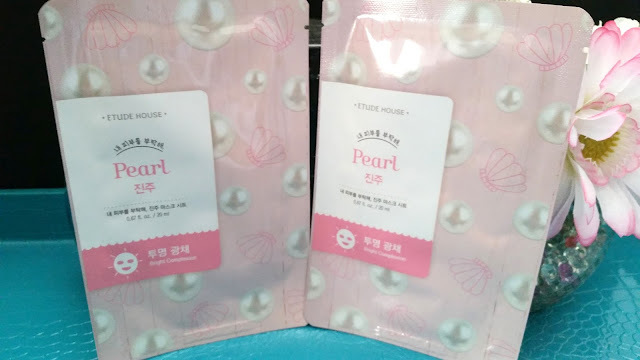 Product Description: Formulated with pearl extracts, this mask is full of amino acids and minerals. It works to brighten up skin complexion. 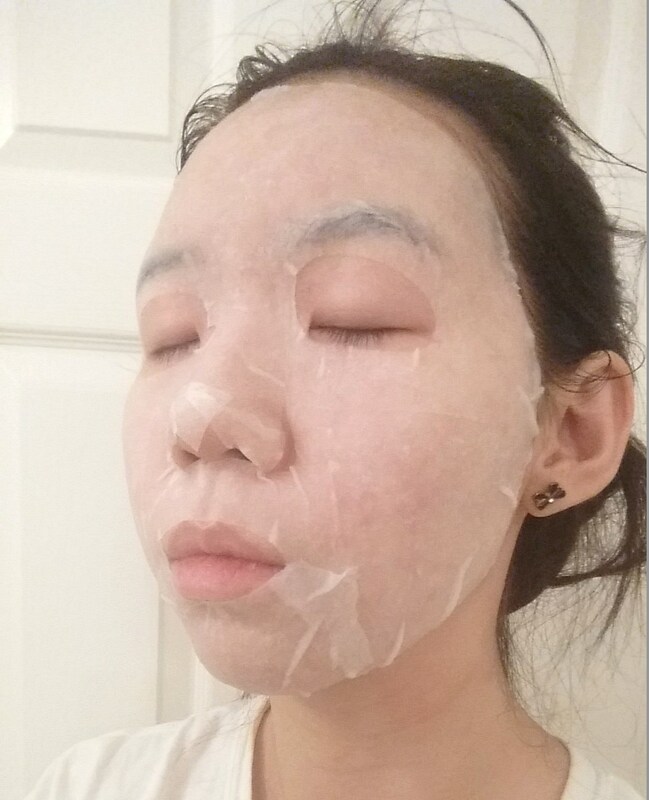 The mask contains grapefruit extract, hydrolyzed pearl (20mg), Ginko extracts and more. To Use: Cleanse and tone the face first. Remove the mask from the pouch and apply it to the face. 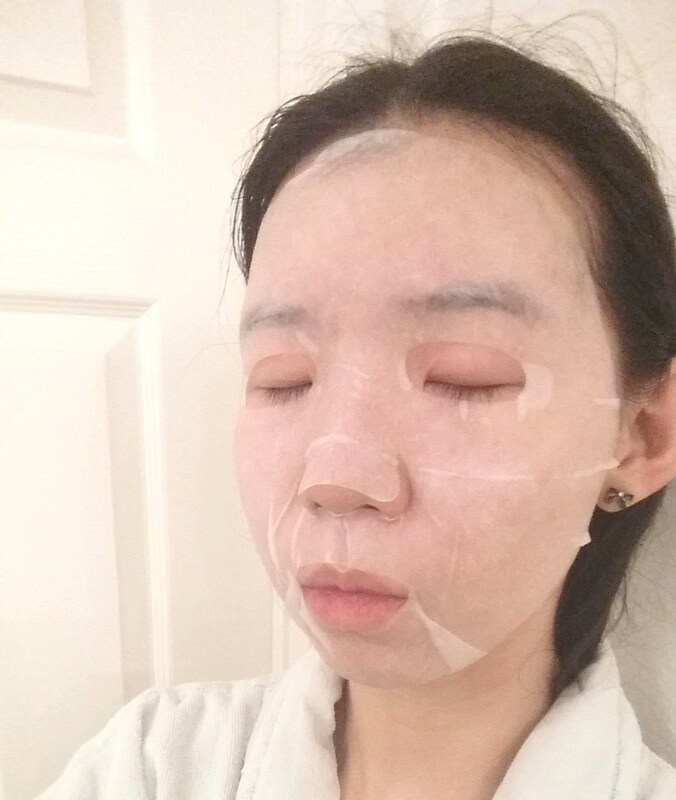 After 10 to 15 minutes, remove the mask and massage in the remaining essence. Continue with the rest of the night time skin care routine. Scent: The Pearl mask has a fragrance perfume smell to it. It's floral but not overwhelming. Ingredients: WATER, BUTYLENE GLYCOL, GLYCERIN, CITRUS PARADISI (GRAPEFRUIT) FRUIT EXTRACT, ALCOHOL, PANTHENOL, CARBOMER, PEG-60 HYDROGENATED CASTOR OIL, XANTHAN GUM, HYDROLYZED PEARL (20MG), POTASSIUM HYDROXIDE, ETHYLHEXYLGLYCERIN, ALLANTOIN, CAMELLIA SINENSIS LEAF EXTRACT, SOPHORA ANGUSTIFOLIA ROOT EXTRACT, LONICERA JAPONICA (HONEYSUCKLE) FLOWER EXTRACT, PRUNUS PERSICA (PEACH) LEAF EXTRACT, PAEONIA ALBIFLORA ROOT EXTRACT, GINKGO BILOBA LEAF EXTRACT, SCUTELLARIA BAICALENSIS ROOT EXTRACT, DISODIUM EDTA, PHENOXYETHANOL, FRAGRANCE. Ingredients: WATER, BUTYLENE GLYCOL, GLYCERIN, CITRUS PARADISI (GRAPEFRUIT) FRUIT EXTRACT, ALCOHOL, PANTHENOL, CARBOMER, PEG-60 HYDROGENATED CASTOR OIL, XANTHAN GUM, POTASSIUM HYDROXIDE, ETHYLHEXYLGLYCERIN, ALLANTOIN, NIACINAMIDE, SODIUM STARCH OCTENYLSUCCINATE, CALCIUM PANTOTHENATE, MALTODEXTRIN, SODIUM ASCORBYL PHOSPHATE, CAMELLIA SINENSIS LEAF EXTRACT, TOCOPHERYL ACETATE, PYRIDOXINE HCL, SOPHORA ANGUSTIFOLIA ROOT EXTRACT, LONICERA JAPONICA (HONEYSUCKLE) FLOWER EXTRACT, PRUNUS PERSICA (PEACH) LEAF EXTRACT, PAEONIA ALBIFLORA ROOT EXTRACT, GINKGO BILOBA LEAF EXTRACT, SCUTELLARIA BAICALENSIS ROOT EXTRACT, SILICA, DISODIUM EDTA, PHENOXYETHANOL, FRAGRANCE. Expiration: Usually the manufacturing dates are listed on each of these masks. The mask makes note that it expires 24 months from the manufacturing date. Which means, if your mask is manufactured Aug. 29, 2014 it will expire Aug. 29, 2016. These are probably some of the cheapest masks I've ever tried. Cheap does not necessarily mean they are horrible but don't expect to find gold in them or anything either. I generally use masks like these multiple times a week. Since they are cheap, I don't feel bad for using them so often and they don't make my wallet sad. These Etude House I Need You masks have alcohol and fragrance in them. If you don't like to use products with alcohol or fragrance, then I'd suggest avoiding these. There are many articles online that have conflicting information on whether alcohol in skincare is good or bad. I won't go into that gray area today. I think it is more of personal preference. Personally, I am trying to use less products with alcohol in them because I want to see if it makes a difference on my sensitive and acne prone skin. However, some of my favorite masks also have alcohol in them so it makes it hard to cut down. Which is why I am not completely cutting products with alcohol out, but simply trying to use less of them. If you have sensitive skin like me, you might want to patch test new masks before you use them. My patch tests are generally lengthy, however, they are relatively short for sheet masks. For masks that I've never tried before I usually open the pouch a day in advance or the morning of and test the mask essence on my wrist first then my face if there was no negative reaction on the wrist. If there's no negative reaction overall, then I'd use the mask. After I've patch tested the mask essence, I always fold and clip the pouch to keep the mask fresh and always use them within 24 hours. I hope you are ready for some mask selfies. If not, they are coming anyways! No cuts were made to this mask, just pull and fold. Pearl sheet mask: This mask was okay in my opinion. Nothing special about it. I only noticed minimal brightening effects after I removed the mask. I left the mask on for 15 minutes each time before I removed it and by the time I removed the mask, the majority of the mask sheet has pretty much dried. It is very different from the Vita Complex masks I used, which was soaked in essence. For me, the scent of the mask was okay, not too overwhelming but definitely perfumed. I'm glad I tried this mask though because the only Pearl masks I've used before are from My Beauty Diary and I wanted to branch out and try others. The fit of this mask is not great and I usually have to play around with it for a bit to have it sit well on my face. 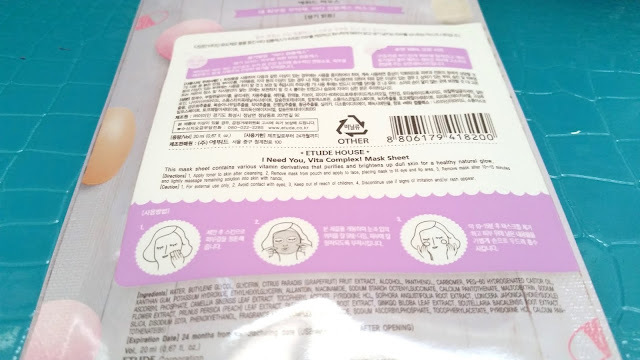 The Etude House I Need You line's mask sheets are not easily tear-able, so if I want to adjust them I have to use scissors. If I'm lazy and don't want to cut anything, I'd just pull and fold, that usually does the trick. For me, the chin area always has excess mask folds while the nose area always lack some. As you can see in the picture above, the tip and partial sides of my nose are not covered. These sheets are not dripping with essence and they dry relatively faster than some of my other sheet masks. Which is probably why it's only advised to leave these on for 10 to 15 minutes. Whereas, I usually wear my other masks for 20 to 30 minutes. Both the Pearl and the Vita Complex works to brighten skin complexion, which is why I decided to put them up against each other to see which works better. After trying both, I found that I like the vita complex more. It felt more moisturizing on the skin and the brightening effect was more noticeable too. Both masks do not make too much different to the skin complexion, however, I saw more of a brighten complexion after the Vita Complex mask than the Pearl mask. Cuts were made to this mask so it can fit better. 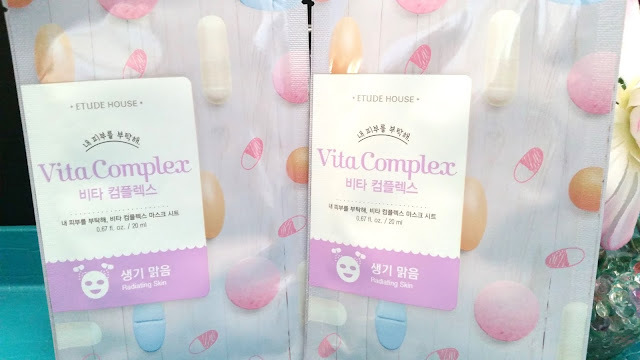 Vita Complex sheet mask: The scent of this mask was fruity and although perfumed, I didn't mind it because it wasn't too strong. I did notice some of the brightening effects after I removed the mask, which was nice. I liked that it felt moisturizing on my face, although I couldn't leave it on for too long because it does dry faster than my other sheet masks. I took my mask down between 15 to 20 minutes and you'll see in the picture below that the cheek areas are still pretty wet, however the forhead and chin areas have become pretty dry. I think for the price, this mask is pretty good.